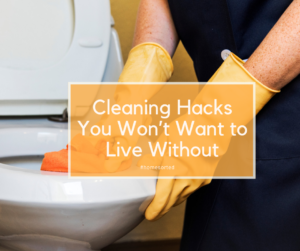 Cleaning Hacks You Won’t Want to Live Without - Home Sorted! We love saving time and getting the home sorted! That’s why we’ve compiled our favourite cleaning hacks into this handy piece. Get ready for your life to be changed! Kitchen sponges are home to a lot of bacteria – especially if you keep yours in or on the kitchen sink. To get rid of nasty bacteria, place the sponge into the microwave for 30 seconds. The sponge will be quite hot, so make sure you wait a couple of minutes before removing. Lint rollers are perfect for collecting dust quickly and efficiently around the house. You can use them on just about any surface and they save you vacuuming time too. Pour one cup of baking soda into your regular washing machine cycle for even brighter clothes. Pour equal amounts of water and vinegar into a microwave-safe bowl, along with a small wooden item like a toothpick as this will prevent the water from boiling. Set your microwave on high for 5 to 10 minutes and walk away. Wait a few minutes to let the microwave cool before opening the door – then all you have to do is wipe down the inside with a sponge or paper towel. Lemon can be added to the mix for a fresh smell. If you’re like most people, you’re probably not getting as much use out of your vacuum attachments as you could be. They can be used to dust and clean just about anything, in particular blinds, vents, cabinets, ducts, and bookshelves. Not only are they extremely effective but they’re quick to use too! Mix yourself a paste of baking soda and water and smear it across the bottom of the oven. Leave for a few hours before wiping off for a shiny as-new oven. Finally, we recommend creating a cleaning checklist for all the odd-jobs around the home. You can choose to delegate these to family members or tackle them yourself. What is most important is that you have a list to cross off – and a reference point for what date things get done!